Ring of fire, originally uploaded by The Bacher Family. Every year, I have a lot of fun experimenting with fireworks photography. It's so hard to get the exposure just right, and you only have about half an hour to work before waiting another year for a chance to practice again! so I'm very pleased with how this one came out: a combination of a nicely-timed long exposure with a flash to capture the movement of the sparkler. 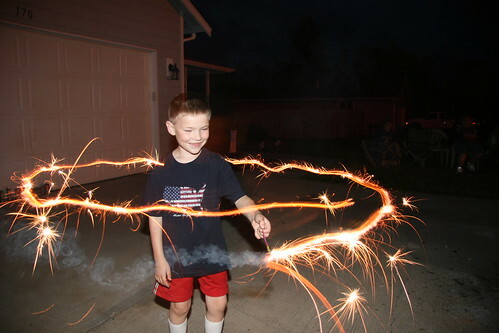 I love that it makes a complete ring, with sparks flying off it all over the place, and I love that the ring disappears behind Daniel's body, even though that must have, in some fashion, been recorded by the long exposure. All in all, a lucky shot that nevertheless was the product of a lot of effort and planning!